Lenore Krasner was born in Brooklyn, on October 27, 1908. Her parents, Joseph and Anna Weiss Krassner, immigrated to the U.S. from a village near Odessa, Russia. Lenore was the next to last of six children and was the first one in her family to be born in the US. Her family ran a small food market in Brooklyn. In 1922, thirteen year-old Lee decided to become an artist and transferred from Brooklyn’s Girls High School to Washington Irving High School in Manhattan. Washington Irving High School was a girl’s high school with an art program. Lee Krasner studied at the Women’s Art School of The Cooper Union, 1926-29; The Art Students League, 1928; National Academy of Design, New York, 1929-32; City College and Greenwich House, 1933. One of her teachers at The Cooper Union, Victor Perard, liked her drawings from life and used some of them for his textbook of drawing. While still at Cooper Union she attended classes in 1928 at the Art Students League, where she studied life drawing with George Bridgman. She studied with Hans Hofmann in New York from 1937-40. In 1932, during the depression, took a waitress job at Sam Johnson’s, which was a Greenwich Village nightclub/restaurant. In 1933, Lee Krasner took courses at the City College of New York and at Greenwich House with the goal of becoming a teacher. When the New Deal’s Public Works of Art project began in 1934, Lee returned to painting. Lee worked as mural painter for the Public Works of Art Project, New York, 1934; Temporary Emergency Relief Administration, New York, 1934-35; Works Project Administration (W.P.A.) Federal Arts Project, New York, 1934; and the Federal Arts Project, Mural Division, 1938-42. Lee Krasner married the artist Jackson Pollock in 1945. In the 1930s the prevailing style of painting on the Public Works Project, and in American art generally, were social realism and regionalism, but Lee Krasner was already painting as a modernist. She took up this style while studying from 1937 to ’40 with Hans Hofmann, who stressed cubist design and exuberant colors. Fauves. She was also influenced by the ideas of the Russian-American Surrealist painter and mystic John Graham. Lee Krasner exhibited her paintings for the first time in June of 1940 with the avant-garde American Abstract Artists in its fourth annual show in New York. John Graham invited her to take part in the January 1942 exhibition of American and French paintings organized by him at the McMillan Gallery. French painters represented in that exhibit included Pablo Picasso, Henri Matisse, and Bonnard. Some of the Americans participating were WPA painters, Willem de Kooning and Jackson Pollock. Lee painted the Little Image series of 31 paintings (1946-50) that represent her first all-over abstractions. With these, she expanded the visual vocabulary of Abstract Expressionism. She painted bold collages during the 1950s, and, late painted large canvases containing brilliant color. See images of her work here. Lee Krasner and Jackson Pollock were married on October 25, 1945 and they settled in an old $5,000 farmhouse in a Community called Springs on Long Island. Lee Krasner painted in an upstairs room of the farmhouse and Jackson Pollock used a barn near the house as his studio. Jackson Pollock died in an automobile accident in August 1956. Jackson Pollock arranged for Lee’s first solo show which was held at the Betty Parsons Gallery in New York in the fall of 1951. Lee Krasner designed two mosaic glass murals, one of which is eighty-six feet long, for the Uris Building in Manhattan. It was completed in 1959, the mosaics were constructed from collages designed in collaboration with Ronald Stein, her nephew. Lee Krasner oversaw the showing of Jackson Pollock’s work after his death. Some major retrospectives of her work were given at Whitechapel Art Gallery, 1965, and Whitney Museum of American Art, 1973-74. Lee Krasner died in New York, on June 19, 1984. 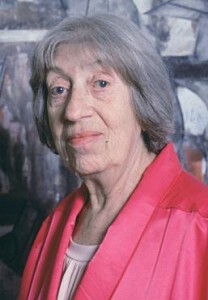 Lee Krasner received the CUAA Augustus Saint-Gaudens Medal in 1974. She was inducted into The Cooper Union Hall of Fame in 2009. She also received the Lowe Fellowship for Distinction from Barnard College in 1974 and an award for Outstanding Achievement in the Arts from the Women’s Caucus for Art, 1980. Lee Krasner with Barbara Novak, videotape, WGBH New Television Workshop Videotape Archives of the Arts, Boston, 1979. Krasner, Lee Oct. 27, 1908-June 19, 1984 Painter, Biography from Current Biography (1974) The H. W. Wilson Company. This entry was tagged Augustus Saint Gaudens Award, Lee Krassner. Bookmark the permalink.